August and September are typically warm and dry in the South Sound. However, this year it has been mostly hot and dry since June. It has been more like Sorrento than the South Sound. Now we can truly boast about our Mediterranean climate. Plants like rosemary, lavender and sage thrive. Dark green-leaved Rosemary ‘Arp’, silvery-leaved Lavender ‘Silver Frost’ and the wide leaves of gray ornamental sage, Salvia ‘Berggarten’ make a good combination. Throw in a couple of potted red geraniums in terra cotta pots, grab a good book and have a glass of Washington wine. Enjoy our extended new Mediterranean climate. 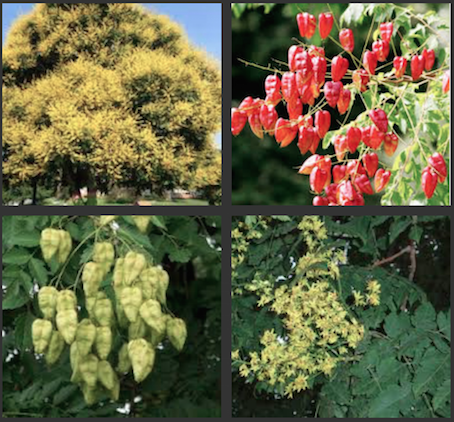 That’s Golden RAIN tree, not Golden CHAIN tree…why these beautiful trees aren’t grown more, I’ll never know. Koelreuteria paniculata (easier to grow than to say) is blooming now. It has panicles of fragrant yellow flowers and ash-like leaves. The medium-sized tree grows in zones 5-9 in full sun or a little shade. That means it’s perfect for the South Sound. The best part about the tree is the fruit that eventually swells into little pink balloons. They make a popping sound when you step on them. Kids love it. Popping fruit may not be the BEST reason to grow this too rarely grown tree but it helps. You can see one up close in Tacoma at S. 11th and Tacoma Ave S. or E. 26th St. near Freighthouse Square. Stunning trees. Linda Chalker-Scott is our local “mythbuster”. Reading her earlier books, “The Informed Gardener” and “The Informed Gardener Blooms Again”, gives you a sense of Chalker-Scott’s mission…to set us all straight about the science behind our gardening questions…nothing is anecdotal. All of the information in “How Plants Work” is backed up by scientific research. If you follow The Garden Professors on Facebook you will recognize the Chalker-Scott name. Advice and answers are “no nonsense” to say the least. 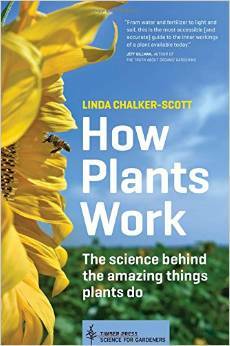 “How Plants Work” is Chalker-Scott’s referential science for gardeners book. Just like in her previous books, she debunks many of the commonly held “facts” but supports others. She names names and explains why some of the more popular home gardening methods and products simply don’t work. Along with setting us straight about our long-held and at times totally false beliefs about gardening the author provides some very understandable layman’s lessons in home gardening botany. She explains the science behind plant growth, water movement, light importance, night bloomers, twining and vining and more. Timber Press, $19.95, 220 p.
This entry was posted in Book Reviews, Garden News, South Sound Magazine Article by Vickie Haushild. Bookmark the permalink.